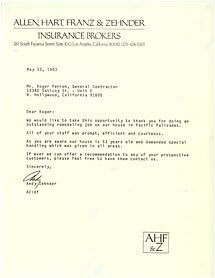 Zehnder – Allen, Hart, Franz – Zehnder » Roger Perron Inc.
We would like to take this opportunity to thank you for doing an outstanding remodeling job on our house in Pacific Palisades. All of your staff was prompt, efficient and courteous. As you are aware, our house is 53 years old and demanded special handling, which was given in all areas. If ever we can offer a recommendation to any of your prospective customers, please feel free to have them contact us.